This cabin is multi-functional. For the RV enthusiasts, there is a large RV storage area that divides the cabin into 2 distinctive areas. The left side is a full one bedroom cabin with a large kitchen and living room area on the main floor as well as a large master suite on the second floor. The right side has a main floor studios apartment with second floor storage. The left side could be duplicated on the right to create a 2 master suite cabin. The main floor of the right could also be used as office space if one were inclined. 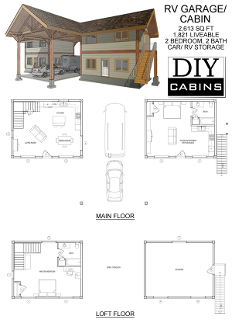 This cabin is a cost effective timber framed style cabin with conventionally framed infilled walls. 3 timber trusses in the middle give it a rustic feeling. This is a perfect cabin for those people that like to travel in their RV, but want a destination spot. A place call home away from home.